Whether you’re an in-house or agency PPC professional, chances are you’ll need to provide regular reports on campaign performance. • What happened before this time frame? • What’s typical for this time of year? • What is the goal of this PPC campaign? • Are the numbers up, down, or sideways? • Why are the numbers up, down, or sideways? • What the heck does this mean, anyway? • What insight can be drawn from this data? • Are key metrics following normal seasonal trends, or is something off the mark? • If something’s off the mark, why? • Did you run a particularly successful ad copy test? • Was there something in the news that spiked click-throughs, but didn’t drive conversions? • What’s going on, and what does it mean to the advertiser? In fact, at gyro, all of our reports and most of our presentations include a What, So What, Now What section. This format helps us to focus on what’s important to the client, rather than charts and graphs. If you must include charts with total impressions, clicks, and conversions, put them in an appendix at the end of the report. Some clients and bosses really do like to pore through raw data, so let them – but only after you’ve told the key story. This one slide in a report often tells business decision makers everything they need to know about their PPC campaign, in one easy-to-grasp view. 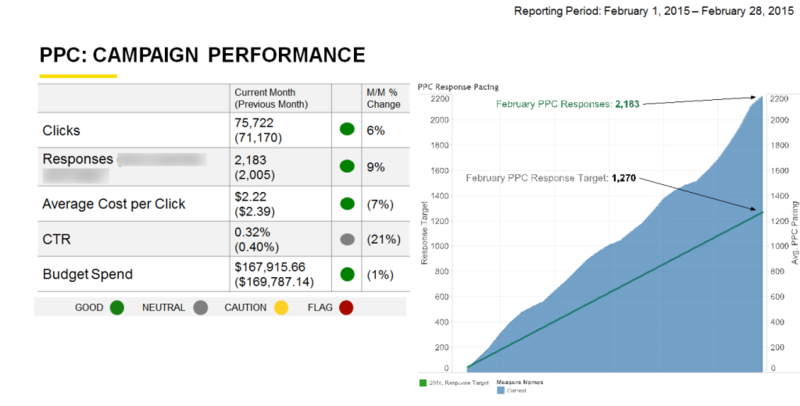 The new report function in Adwords is another way to quickly create meaningful charts and graphs. A PPC campaign without goals is like grocery shopping without a list. You may come home with a cart full of groceries, and you may have gotten some deals – but did you buy what you really needed? Smart grocery shoppers never set foot in a store without a list, and smart PPC advertisers never log in to AdWords without a goal in mind. • Is there a target cost per conversion you’re trying to reach? • Are there certain products on which you were trying to increase sales this month? • Did you launch a campaign with new and different goals? Every chart, graph, and narrative should be created with the following in mind: how does this information illustrate whether the goals were achieved? PPC generates so much data that it’s easy to get lost in the weeds looking at “interesting” statistics. But just because something’s interesting doesn’t mean that it’s important. If it doesn’t relate to goals, leave it out! A good PPC report should include recommendations and plans forward, so the client or boss knows what will happen next. In fact, the recommendations should form the basis of any conversations that come out of the report: the dialogue should be centered on next steps in the optimization process. This is the “Now What” portion of the report. The next time you prepare a PPC report, keep these tips in mind. Your client, or your boss, will thank you. What about you? What elements are must-haves in your PPC reports? Share in the comments! Editor’s Note: Portions of this article appeared at Search Engine Watch on August 9, 2011.